Festival of Indonesian culture will further strengthen our bilateral relations with Azerbaijan. This was stated by Ambassador of Indonesia to Azerbaijan, Husnan Bey Fanani, Report.az informed. 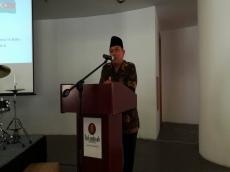 In his speech, Husnan Bey Fanani noted that the third festival of Indonesian culture will be held on September 11-16 in Baku at the Heydar Aliyev Palace and at the Fountain Square. The theme of the festival will be "to Learn the richest culture of the archipelago." The Ambassador noted that this festival will be much wider scale than the previous two. Samples of different Islands of Indonesia, as well as stands will be organized as part of the festival. High-ranking officials from the ministries of culture of Azerbaijan and Indonesia are expected to attend the event. The first ever Indonesian Cultural Festival was held in Baku in 2016. The two-day Indonesian Cultural Festival brought together groups of artists who presented traditional music, folk dance-music and more. The second edition of the festival was held last year and featured a fascinating performance of world-famous jazz musician Dwiki Dharmawan, Indonesian traditional dances and much more. Indonesia recognized Azerbaijan’s independence on December 28, 1991. Bilateral relations between the two republics were established on September 24, 1992. The embassy of Azerbaijan in Indonesia was established in 2006, while the embassy of Indonesia in Azerbaijan was opened in 2010. Indonesia is interested in developing relations with Azerbaijan in the fields of tourism, trade and investment. Azerbaijan is the third largest trade partner of Indonesia. The country is interested in making mutual investments with Azerbaijan in the oil and gas sphere.